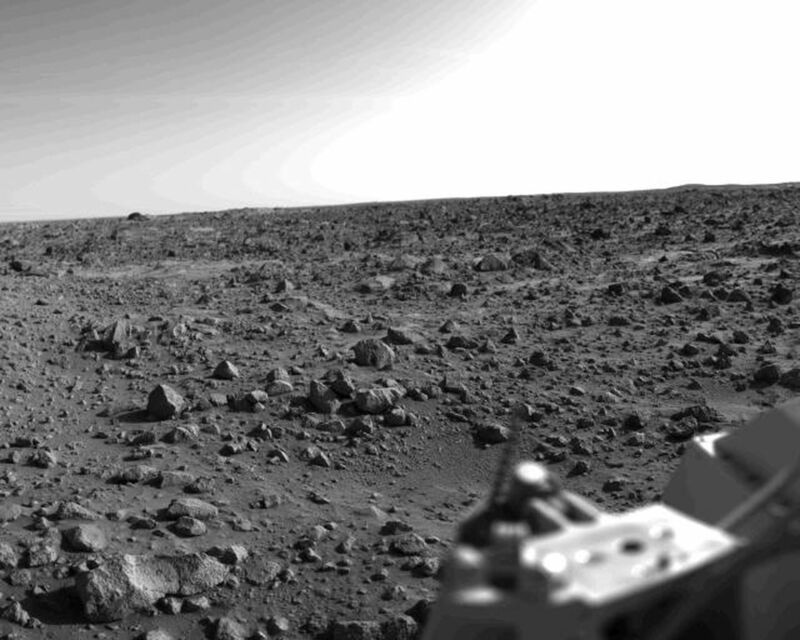 First panoramic view by Viking 1 from the surface of Mars. The out of focus spacecraft component toward left center is the housing for the Viking sample arm, which is not yet deployed. Parallel lines in the sky are an artifact and are not real features. However, the change of brightness from horizon towards zenith and towards the right (west) is accurately reflected in this picture, taken in late Martian afternoon. 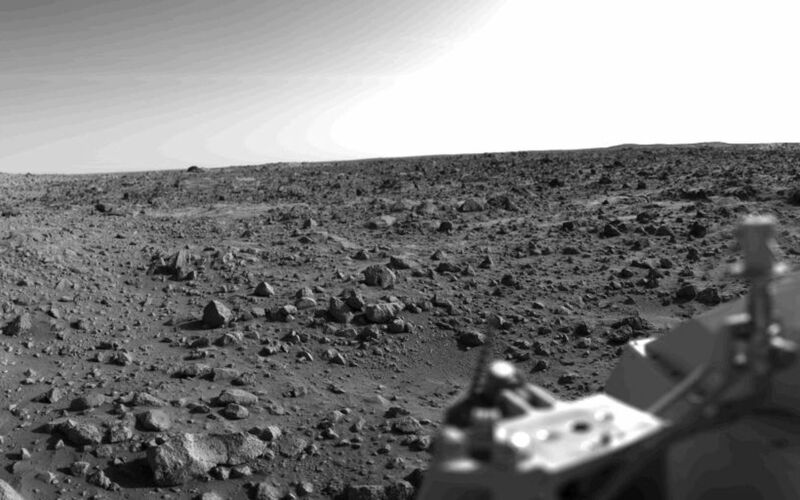 At the horizon to the left is a plateau-like prominence much brighter than the foreground material between the rocks. The horizon features are approximately three kilometers (1.8 miles) away. At left is a collection of fine-grained material reminiscent of sand dunes. The dark sinuous markings in left foreground are of unknown origin. Some unidentified shapes can be perceived on the hilly eminence at the horizon towards the right. A horizontal cloud stratum can be made out halfway from the horizon to the top of the picture. 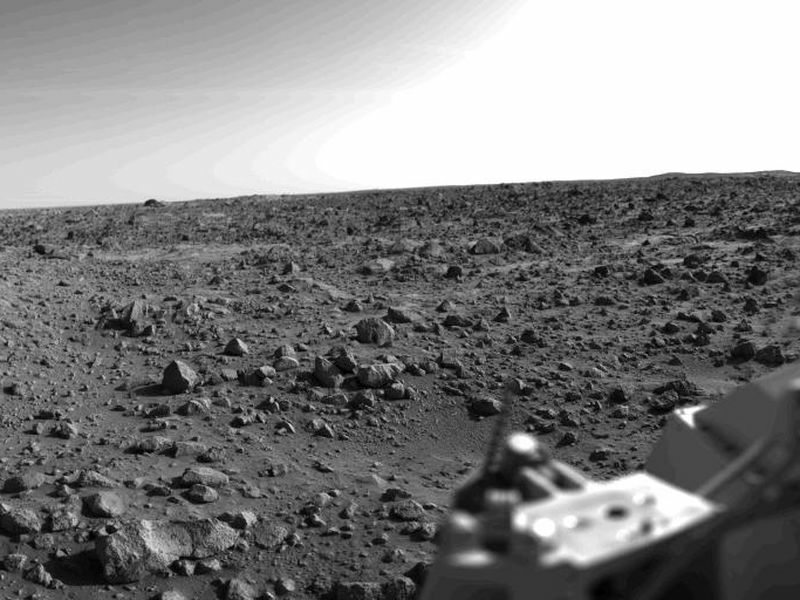 At left is seen the low gain antenna for receipt of commands from the Earth. The projections on or near the horizon may represent the rims distant impact craters. In right foreground are color charts for Lander camera calibration, a mirror for the Viking magnetic properties experiment and part of a grid on the top of the Lander body. At upper right is the high gain dish antenna for direct communication between landed spacecraft and Earth. Toward the right edge is an array of smooth fine-grained material which shows some hint of ripple structure and may be the beginning of a large dune field off to the right of the picture, which joins with dunes seen at the top left in this 300ø panoramic view. Some of the rocks appear to be undercut on one side and partially buried by drifting sand on the other.